MacGyver Shirt- Very Cool MacGyver Shirt Design! 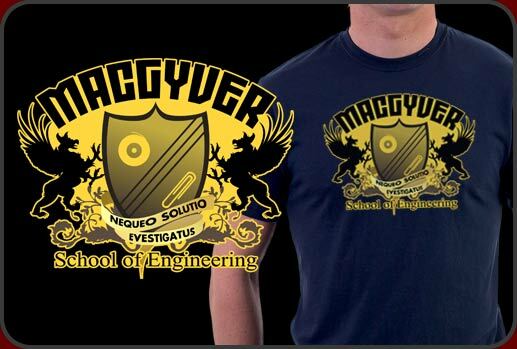 Funny MacGyver Shirt fashioned as a school of engineering crest. Hilarious MacGyver shirt for fans of the classic television show. This is one of those great shirts that takes a moment for people to get. It looks like a cool School of Engineering crest but features the famous MacGyver name and of course a roll of duct tape and paper clip as our hero's weapons of choice. Our MacGyver shirt looks really cool with black griffons holding a large shield and lots of flora giving the design great eye appeal. This is a new t-shirt from our geek line of shirts and is bound to be a favorite among our fans. We have MacGyver Shirts available for men women and children too with lots of hot styles and colors to choose from. Check out our hot MacGyver baby doll tees and comfy all cotton mens shirts too. Oh! And there's also great MacGyver designs available on mugs and fun stickers and buttons as well!